Especially for The Craft Beer Company’s beer festival in their new Clapham pub, ‘Craft 100’, we teamed up with our good friends at Revolutions Brewing Company from Castleford, Yorkshire. Something we have wanted to do for a while is brew a collaborative beer with Mark and Andrew, who's excellent brewery specialises in musically themed ales referencing their vast and eclectic tastes in music. 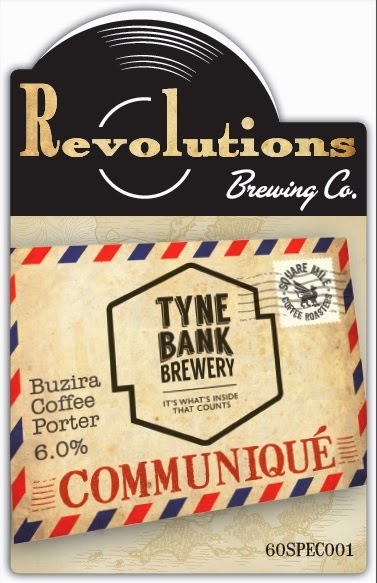 We decided to brew a 6% coffee porter called 'Communique' in honour of legendary Dire Straits guitar player and frontman Mark Knopfler, who grew up in Newcastle. For the beer, we used a coffee from one of London's best roasteries, Square Mile. The Buzira variety from Burundi has hints of blackcurrant, which are enhanced by the addition of Bramling Cross hops. Available at ‘Craft 100’ at The Craft Beer Co Clapham between 3rd – 6th April, and in limited amounts around Newcastle and Yorkshire, this strong yet delicate porter is bursting with berry flavours and subtle coffee notes, hiding its 6% ABV very well.